My Aussie pal, Elena, made an observation about Irish salad/sandwich bars... “What’s with all the mayonnaise!!! !” she asked. It’s true. It is practically impossible to avoid mayo in Ireland. We even have a county called Mayo. As a broad generalisation, if you walk into a sandwich bar in Ireland your choices are limited: You may be offered tuna... mayonnaise; or egg... mayonnaise; or if you manage not to have mayonnaise in your main filling choice, the server will try and foist some “coleslaw” on you. What is this coleslaw, only shreds of cabbage and carrot drowned in a sea of... mayonnaise. If you manage to parry the coleslaw, they will launch a final offensive, the squeezy mayo bottle already in their hand, and smilingly offer you a squirt to glue the top slice of bread in place. I have nothing against mayonnaise – the sort that has actually seen a fresh egg yolk or two, a spoonful of Dijon mustard, some garlic and a light olive oil can be unbelieveable good. And I’ll admit that sometimes even Hellman’s is just the thing – but all things in moderation. We're hiding from the mayonnaise! 1 Place all the ingredients - except the parsley – in a medium saucepan over a medium heat and bring to simmering. Simmer uncovered for 5 minutes. 2 Using a slotted spoon, remove the mushrooms and place in a serving dish. Now turn up the heat and allow the sauce to reduce and thicken for a further 5 minutes or so. 3 Taste the sauce and add salt and or pepper if necessary. Then pour the thickened sauce over the mushrooms and leave to cool to room temperature. Scatter with the parsley before serving. This dish will keep for a few days if refrigerated but is best at room temperature. Served hot, it is also wonderful with grilled meats. @Three-Cookies - yes! especially the mass-catering stuff that comes in a bucket. You could paint the outside of your house with that stuff. Hehee. Couldn't agree more with you, Hester. Painting the house with it, though? That's a new one ;-) Love the homemade stuff but I adore your mushrooms - and that photo of them hiding in the grass is sensational! Huh, I had no idea that there was a lot of mayo in Ireland! I don't really like mayo... but I would LOVE these mushrooms! Thanks for sharing! Looks yummy Hester. I remember many many moons ago my husband was 'trying out' for a Chef job back in the US. He came home from his 'trial' day and when I asked him how it went he said he did not want to work there because they used 'schmellmans' ... Although I am not a huge fan of mayo, we do make our own and love it. You are right, it has its place. Hahahaha I must admit I love mayo... but the good one... homemade above all. But definitely NOT on mushrooms! ;-) These look awesome and you picture is so good, makes me want to have them for lunch!!! I tend to stay away from too much mayo, but homemade is yummy. That mushroom salad sounds lovely. What a nice change from the norm. Ha! Its the same way here in the South Eastern United States. They drown everything in mayo and it generally turns my stomach. 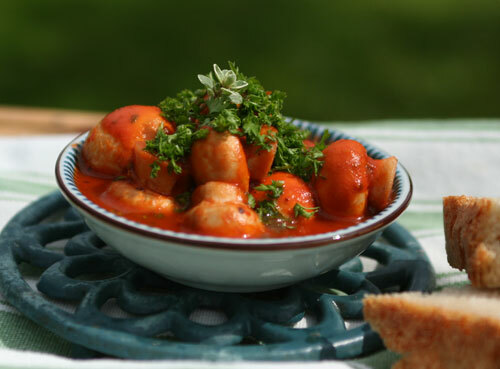 The mushrooms look delicious and do look like they would be perfect with some good crusty bread! Your photography is just beautiful! I did not know that mayo is to Ireland as tomato sauce is to Italy. How interesting! Your mushrooms look great with this bright sauce! I'll try this for sure. Ciao! Haha, I'm kind of a mayo addict...but I probably stay that way because I keep it as a treat. This looks like a great way to get away from it, though, if you're looking to do so! I love mushrooms, but the mushroom mayo combo doesn't fly with me, either. Your recipe looks delish! Thanks for the recipe, in my homour, WOW! Hooray for non-mayo! I do love mayo myself, but homemade or as Hester sugested, Hellmans, not that horrid sweet stuff... and just not everywhere! The mushrooms look so so yum, and perfect for Melbourne now, in the midst of deep autumn-winter. Perfec! This is a wonderful post and left me with a big smile. Hello Aussie Julie here. Yes, we like the dead horse (slang for "sauce" ) down under. In fact here in Germany they love their yoghurt sauces. Like the mushroom dish and it is different with the mayo! You've experimented! Hi Hester! You have a lovely recipe here. I love mushrooms but never tried eating this way. Thanks for sharing and just bookmarked! i am so glad to see this mayo-free recipe since it turned out very nicely! first time here...love your space..awesome posts with nice presentation.. I like mayo just not with my mushrooms. I have yet to make it homemade.I use shmelmans. Your recipe looks great! Ohhhh Hester- these mushrooms look so so good! I'm a huge fan of mayo, but definitely not on mushrooms. Great post! Such a funny post, the County Mayo reference is gas!!! Great recipe as usual! 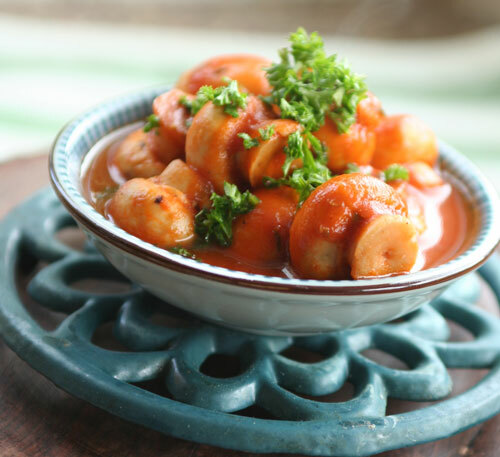 Yummy and picture-perfect mushrooms! Loved the post. I trained as a chef in Ireland and can attest to the heavy dependence on Mayo in salads. I love al la grecque.